(Dan Trimmer, 1998). 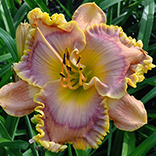 Tet (Ida’s Magic x Enchanted April) 32” M Dor Re Fra this 5 3/4” flower drew much attention last year in the garden. Unusual, for a gold edged cultivar MAXFIELD PARRISH is dormant. Three laterals hold about 35 sunfast blooms per scape. The foliage is is dark green, and the plants are vigorous. Unlike MARQUEE MOON, which is also out of my ENCHANTED APRIL, MAXFIELD PARRISH performed very well in Florida. (Both APRIL & MAXFIELD are named for American artists I admire) Fertile both ways MAXFIELD brings Brother Charles genes into play with a degree of sunfastness and branching I admire. Photographed on a first scape on Long Island.